The six yogas of Naropa describe a set of advanced Tibetan Buddhist tantric meditation practices compiled in and around the time of the Indian monk and mystic Naropa (1016-1100 C.E. ), and conveyed to his student Marpa the translator. The six yogas were intended in part to help in the attainment of enlightenment in an accelerated manner. As Naropa is a Kagyu lineage holder, the six meditative practices are strongly associated with the Kagyu lineage of Tibetan Buddhism. 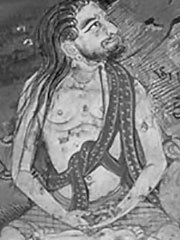 Naropa’s student Marpa taught the Tibetan Milarepa, renowned for his yogic skills. Milarepa in turn taught Gampopa. Gampopa’s student, the future first Karmapa, Düsum Khyenpa, attained enlightenment while practicing the Fifth Yoga (also known as «Dream Yoga»). The Karmapa, the first figure in Tibetan Buddhism to reincarnate, has been strongly associated in certain reincarnations with particular yogic attributes. Many Gelukpa practitioners, including the Dalai Lama, are expert in the six yogas of Naropa.